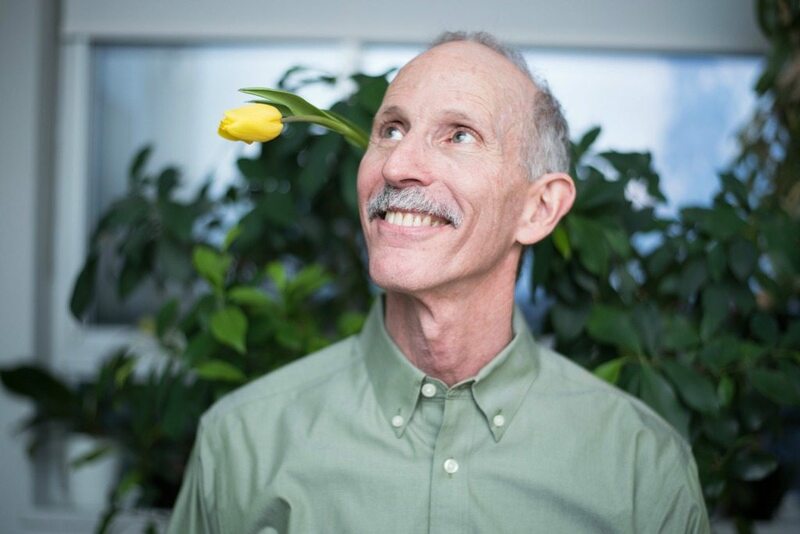 "I doubt there's a person here whose life wasn't changed by Jon Kaplan." 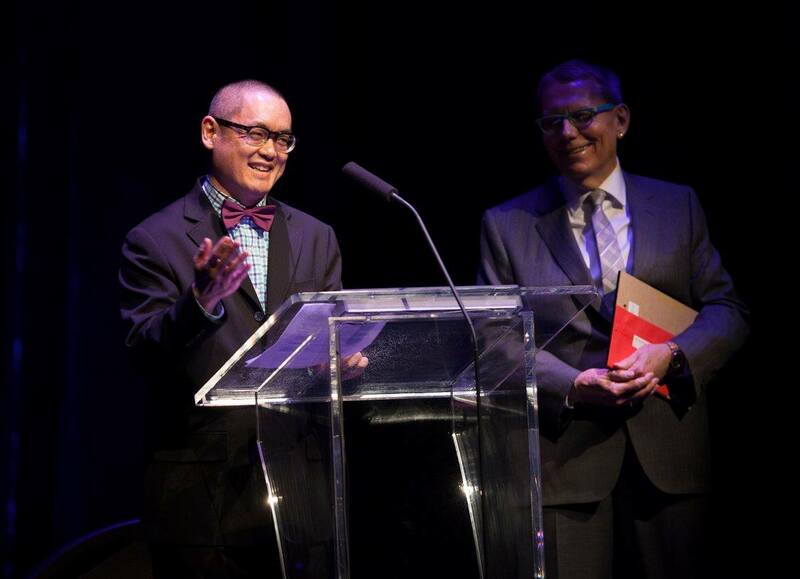 Now Magazine’s Glenn Sumi walked on stage with Jon Kaplan’s husband of 44 years, Don Cole, to co-present the audience choice award, newly christened Jon Kaplan Audience Choice Award. Photo via Facebook. As for the awards themselves, there were some expected big wins and more than a few surprises at the Toronto Alliance for the Performing Arts‘ celebration of the city’s best theatre, opera, and dance productions. But among the many diverse stories, two themes could be discerned: accessibility, and a shared sense of loss for a devotee to the community. The awards, hosted smoothly and enjoyably this year by actor Raoul Bhaneja and his band The Big Time, were broken down into some oddly defined divisions—general theatre, independent theatre, young audiences theatre, musical theatre, opera, and dance—and were spread among a wide variety of companies and productions. Arguably the biggest award of the night, however, was the NOW Magazine Audience Choice Award, voted on by the public—and that award, which had been given out for years by NOW’s long-time theatre reviewer Jon Kaplan, was renamed for him, in a mark of respect for a man who many in the room could say helped kickstart their professional careers. This idea of community, that extends past the stage to dedicated patrons (including the night’s Silver Ticket winner, arts manager Jane Marsland), reviewers, and more, was even picked up on by Mark Markczyk of The Lemon Bucket Orkestra, whose Counting Sheep interactive musical experience picked up awards for his choreography, and best musical ensemble. “Thank you for being so open and welcoming to us in your community,” he said, and his band and castmates closed out their acceptance with a short Ukrainian song of thanks. 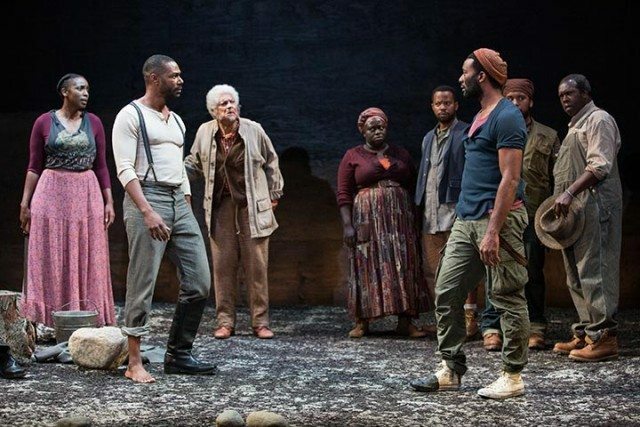 Soulpepper’s production of Father Comes Home From The Wars: Parts I, II, and III, won Outstanding Production at the Dora Awards last night. Photo by Cylla Von Tiedmann. More on the assorted awards: the wildly successful Come From Away, which has already won a bevy of awards stateside and is currently running on Broadway, picked up three awards: Outstanding Production, Outstanding Performance (Female) for Jenn Colella in the musical category, and the aforementioned Jon Kaplan Audience Choice Award. 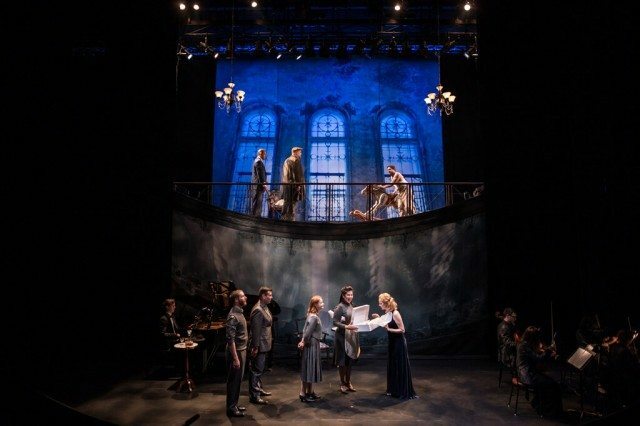 Soulpepper Theatre, which is on the cusp of opening a total of 11 made-in-Toronto productions in New York in showcase at the Pershing Square Signature Centre, won five awards in the general category, including Outstanding Production for Father Comes Home From the Wars (Parts I, II, III), and best ensemble for Incident at Vichy. In the opera category, where usually the nominees (and winners) are no-shows for the ceremony, the team behind Tapestry Opera were a noticeable (and vocal) exception; their production of Rocking Horse Winner took home five awards, including best production and best direction, for the company’s artistic director Michael Mori. But the company with the most number of “gongs” for the night was The Theatre Centre. Their innovative residency program, which acts as an entry point to emerging and difficulty to define artistic work, garnered six awards in total in the independent and dance categories, including two awards for This Is The Point, a co-production with Ahuri Theatre, that featured disabled couple Liz MacDougall and Tony Diamanti, and able-bodied couple Dan Watson and Christina Serra (talking about their experiences raising a child with cerebral palsy). Diamanti, an author and comic cut-up who communicates in public with a head-mounted stick and letterboard, was the only winner of the night given a bit more than the strict one-minute time limit for his acceptance speech for their Outstanding Ensemble win, as TAPA recognized the crucial difference between equity and equality. That theme of equity and accessibility was positively pervasive throughout the night’s proceedings. In the young audiences division, the unorthodox pairing of J.M. Barrie’s classic Peter Pan with a tour of Toronto’s breweries was a gamble that paid off in three Dora Awards for Bad Hats Theatre; the emerging young company’s use of donated spaces few would associate with children’s theatre gave their collective of millennial performers an opportunity to produce and perform their work on a shoestring budget. And in speeches, several performers urged theatre companies and creators to look beyond typical casting and creative choices in their work. Watson, accepting This Is The Point‘s Outstanding Production award, noted, “Many of the people [Ahuri Theatre] works with can’t be on this [Dora Awards] stage; not because of ramps or elevators, but because the work excludes them.” Accepting the Best Ensemble award for Incident at Vichy, Courtney Ch’ng Lancaster, the sole female cast member in the ensemble of 18, capped her remarks with a exhortation: “Because I’m up here—put people in plays, whether they’re boys or girls or of colour…” and the crowd’s applause drowned out the rest of her litany. For the full list of winners, you can visit the TAPA website, or Intermission Magazine’s easier to read list and liveblog of the night.